1959 Simplicity #3021 vintage sewing pattern, misses' set of blouses. 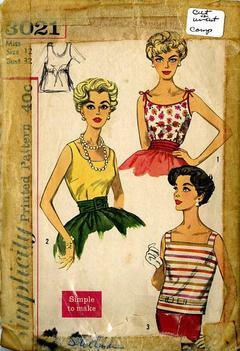 'Simple to Make' blouses are sleeveless. View 1 has low rounded neckline with tie shoulder straps. View 2 features low round neckline. View 3 overblouse has low square neckline and self fabric band with bow trim. Envelope is in poor condition, pattern pieces in good condition.